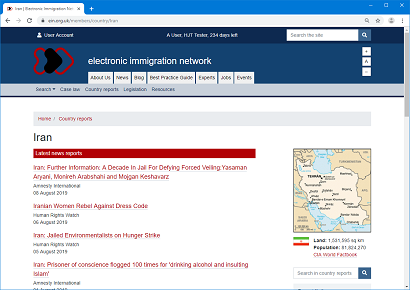 Electronic Immigration Network (EIN) is the UK's largest specialist provider of information on immigration and asylum case law and country information via the internet. We're a registered charity and we've been online since 1998. EIN provides an online resource for immigration practitioners and for others with an interest in immigration, including immigrants and asylum seekers, students, journalists, judges, academics and researchers. The EIN website comprises two main areas: the free Public Site and the subscription Members’ Site. The Public Site gives access to general news and updates on immigration, as well as events and immigration law jobs. The Best Practice Guide to Asylum and Human Rights Appeals and the ILPA & EIN Experts Directory are also both freely available on the public site. The Members' Site gives access to our unique databases that contain case law, country of origin reports, legislation and general immigration resources. Our renowned case law database provides easy access to immigration and asylum-related decisions from the Tribunal up to the European Court of Human Rights. Also available to EIN members is the ability to compile and create court bundles. Prices to join EIN are available here and you can join by signing up here. EIN is a registered charity (Registered Charity No: 1059147). EIN is a membership organisation and joining EIN gets you access to the materials on the EIN Members' site (click here to join and start using EIN straight away if paying by card). EIN members range from the judiciary to small NGOs. Our core member base is legal practitioners. The EIN website has built up a reputation as an indispensible resource for immigration law practitioners, with a December 2016 review of asylum practitioners by the Solicitors Regulation Authority finding EIN was used by 92% of the firms surveyed. The EIN website launched back in 1998 in order to make immigration Tribunal decisions available electronically. 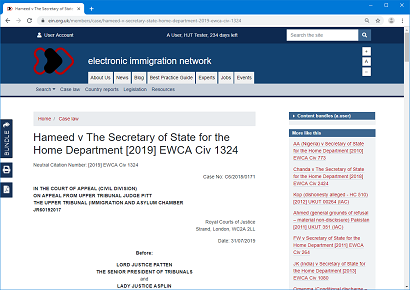 The EIN Case law database has since grown into a unique resource, with the full text of thousands of immigration decisions, with Immigration Tribunal determinations and selected judgments from UK higher courts and European courts. All decisions are chosen for their relevance to immigration and refugee law, saving you time sifting through general legal databases to find relevant immigration cases. In addition, experienced legal practitioners add EIN 'index terms' to classify cases by keywords or phrases. You can see at a glance if a case might be relevant, and you can search by index terms to find relevant cases. Important cases feature a headnote summary, written for EIN by a leading immigration barrister. EIN maintains databases of relevant immigration legislation and general immigration resources. The legislation database includes the full text of relevant Acts of Parliament and Statutory Instruments. The country information on EIN is provided by HJT Research*. It has been available on EIN since 2002 and has grown into a massively comprehensive resource for asylum practitioners and for those wanting information on human rights conditions in refugee producing countries. It contains the full text of over 200,000 reports (as of January 2017) and is updated daily with the latest country information. Every one of the over 100 countries covered has its own separate homepage, with reports categorised by type and publisher, making it easy to navigate and find relevant content. 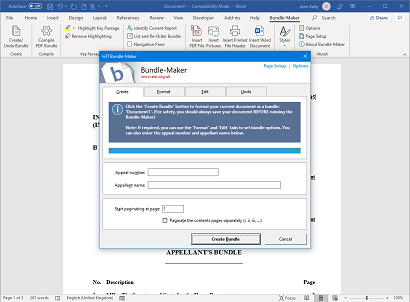 And you can use the country reports in conjunction with the special 'bundle' feature (see below) to create fully paginated and indexed Microsoft Word format court bundles. * To access the country information on EIN, you will need to take out a joint EIN/HJT membership (or a HJT Only membership if you only require the country reports). The unique EIN bundle feature has been available since 2002. It enables you to add EIN materials to user created bundles of documents, all stored on the EIN server and accessible from anywhere you log in to EIN. Any one of the over 200,000 cases and country reports on EIN can be added to a bundle with a single click. And you can then turn your document bundles into court-ready, fully paginated and indexed Microsoft Word format bundles via a special add-in for Microsoft Word. The add-in is available as a free download for all EIN members (including those only subscribing to case law) and is available for all versions of Microsoft Word for Windows from 97 to 2016. You can highlight key passages to automatically create your required schedule of essential reading, and you can edit these bundles like any normal Word document and add your own materials, including your own text and Word documents. The software even allows you to add PDF files and create a single, fully paginated PDF bundle. You can read a brief guide on how to create a bundle here. If you have to create bundles for the Tribunal, the EIN bundle function will save you countless hours of work. EIN is fully searchable via an advanced, high speed search engine. The search is exceptionally intelligent yet simple and easy to use. You can search the whole of EIN or you can choose to search each database individually. Results can be sorted by relevance or by date, easily letting you find the most relevant or the most recent materials. EIN is a mobile friendly website and responds to fit tablets and smartphones. You can easily browse and access EIN's databases on your smartphone, ensuring you have access to the information you need whenever and wherever you need it. Even the advanced searching and the bundle features are easily usable on a smartphone, allowing you to find and save case law on the move. Prices to join EIN are available here (to access the country reports on EIN, you will need to take out a joint EIN/HJT membership or a HJT Only membership). You can join EIN by signing up here. Select the number of passwords and the membership type you require, enter your details and you can start using EIN straight away if paying by card. All card payments are handled securely by WorldPay.